In graphing Trigonometric Functions, there are cases that you need to change the interval of the x-axis in terms of π. In this tutorial, you will learn how to change the interval of the x-axis. 1.) Right click a blank space on the Graphics view and then click on Graphics... from the pop-up menu to display the Preferences dialog box. 2.) 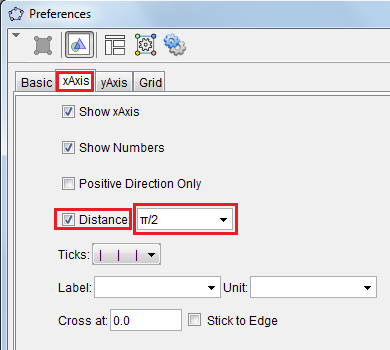 In the Preferences dialog box, click on the xAxis tab, and then check the Distance check box. 3.) 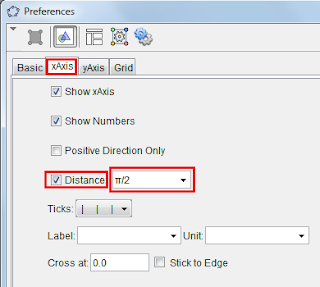 In the drop-down list box at the right of the Distance check box, select π or π/2 and then click the Close button to close the dialog box. After step 3, the interval of the x-axis should be π or π/2. I'm additional possible to urge yourself kicked off my web log before long, however i am simply a touch lost on everything. can you recommend you offer attention to a freed from charge of demand program like WordPress or get a paid option? There square measure such a large amount of decisions out there that i am fully lost. Any referrals? Thanks a great deal a great deal. Thanks, very nice article and useful information sir. i, I am a regular reader of your blog and I found that your blog posts are amazing and very knowledgeable, which helps me lot. I want to thankful to you for your valuable information. And you can check also Actress WhatsApp Group for discuss about the film industry. do you want to download coc private server? if yes here you can get the latest game update for clash of clans. available coc hacks online with free updates. download the clash of clans server online here today. every body want to download the coc server with gems, gold at clash of clans private server. enjoy every time, every person with our best site of clash of royal and clash of clans.